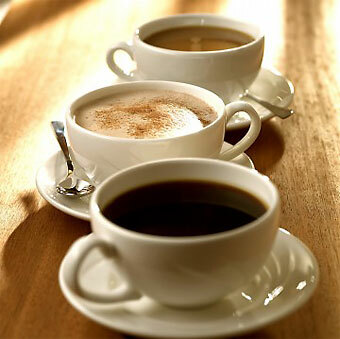 Caffeine is a somewhat crucial part of many of our diets, and can be a savior from moody mornings. As college students and summertime working professionals we tend to just stop anywhere for coffee on our way to work, rarely taking the time to analyze whether or not your Grande Skinny Vanilla Latte is really worth $4.40. I don’t know about you, but if I’m gonna spend that much, I want to at least know I’m getting the best value around. So: I selected a range of options, and compared and contrasted each café based on the quality, price, range and customizability. It is then up to you to decide which criteria you value most. Ready? Go. Starbucks. Let’s tackle the big guns first. Starbucks ranks first in terms of quality, range and customizability, and last in terms of price. They offer a wide range of good quality products including Tazo Teas and coffee which is produced by strict guidelines (Coffee and Farmer Equity Practices), which ensures quality for both the consumer and the planet. They also allow us to choose our milk type (whole, non-fat, soy), whip or no whip, iced or hot, sweetness (pumps or classic), etc. McDonald’s. The new McCafé outposts have unexpectedly tasty coffee. They score high for their cheap pricing, and average in terms of quality, range and customizability. Their coffee is quite good and they offer Higgins and Burke teas. Be aware that their flavored drinks tend to be over-sweetened. Nonetheless, they offer a variety of flavored lattes, mochas and cappuccinos which come iced or hot with whole or non-fat milk. In comparison to Starbucks, McCafé is considerably cheaper–but there is definitely less variation, and quality suffers a bit. However, if you fancy chicken Mcnuggets, chicken snack wrap or even a yogurt parfait along with your morning beverage, McCafémay be your one-stop shop. Dunkin’ Donuts. DD is is up next–the grandfather of coffee on-the-go. Dunkin’ gets top marks for their affordability, and mid-high in terms of range. However, with respect to quality, they rank low. Their coffee tastes sub-par and their flavoring is overly synthetic. Hot tea tastes like hot water and their hot chocolate tastes like it’s from a ski-cabin machine. Furthermore, their specialty coffees such as the Dunkaccino (hot chocolate and cappuccino) and Vanilla Chai cannot be ordered non-fat and taste unnaturally sweet, especially in the morning. However, if a classic coffee and donut combo is what you so desire, Dunkin’ Donuts is the place to be. On a side note, Dunkin’ Donuts’ bagel and cream cheese trumps Starbucks’ any day. My favorite is their cinnamon raisin bagel with plain cream cheese. Local. For the environmentally friendly among us who prefer eating at and supporting local businesses, there are numerous small coffee shops popping up near college campuses across the country. Brown University is home to Blue State Coffee, which unquestionably wins in terms of quality of their coffee and tea. You can order loose leaf tea, freshly ground coffee and even freshly baked slices of raisin walnut toast with butter. Their grilled cheese sandwiches are fantastic, especially on olive bread, and their prices are reasonable (slightly less than Starbucks). The problem is these local coffee shops tend to be less conveniently located. Armed with the knowledge of who offers the highest quality of your preferred drink for the most reasonable price, the decision is yours. Couldn’t agree more…The price is right at McDonald’s but their flavoured drinks are overly sweetened. It’s like drinking cotton candy. I like the quality of Starbucks…their Tazo AWAKE tea is the best traditional black tea you can get…other than what they brew up across the pond. Breakfast at Blue State Coffee is perfect…raisin walnut toast with loose leaf English Breakfast tea is my favorite. At starbucks Americans and Double Shots on ice are also pretty cheap and easy to customize and basically everything we love about starbucks. It can be a classic nice valuable little bit of info. I will be delighted you discussed this beneficial info here. You should keep us up to date like this. Appreciate revealing.